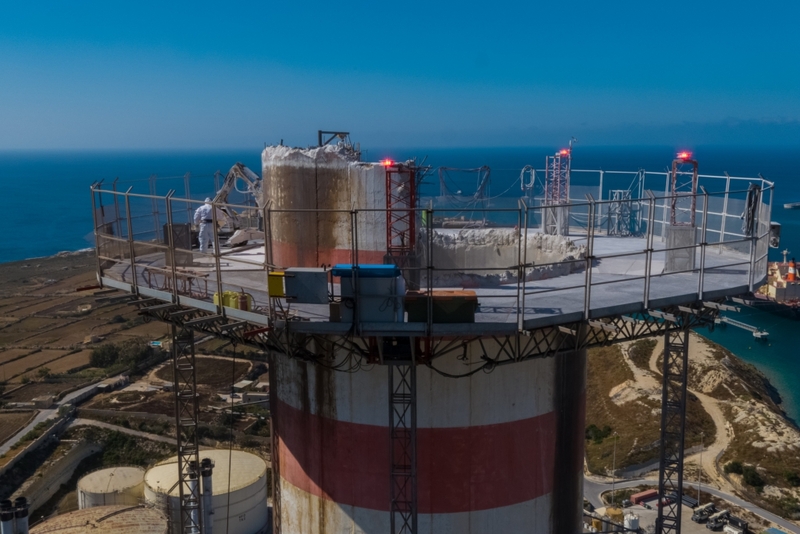 Enemalta plc continued with the dismantling of the last remaining HFO-fired power plant at the Delimara Power Station and its 150-metre chimney. A few days ago, the Company’s demolition contractors started with demolition of the 150m heavily reinforced concrete windshield. The plant’s chimney structure consists of a cylindrical concrete shield rising up 50 storeys, with a base diameter of 12 metres. The concrete walls are 80 centimetres thick at the bottom and 30 centimetres on top. Inside the concrete structure there were two 2.3 metre steel exhaust pipes that emitted the smoke produced by the oil-fired boilers. The dismantling process started with the removal of the lowermost part of these two steel pipes, which connected the chimney to the boilers. The remaining metal pipes, ladders and platforms higher up inside the chimney were lowered to the floor, so that they could be safely dismantled on the ground. Outside the chimney concrete walls, the contractors erected an auto-lifting platform on five steel columns rising to the topmost part of the structure. Once all the metal inside the structure was removed, remote-controlled demolition excavators on top of the platform are being used to demolish a height of 1.5 metres of the concrete wall above the platform. The platform will then be lowered another 1.5 metres for the demolition robots to repeat the process. All debris will reach the base of the chimney through the inside of the chimney concrete wind shield, to minimise dust dispersion. It will then be loaded on trucks at ground level. One must say that sometimes this process is hampered when the wind blows in excess of the safety limit, that of 50km/hr. In such occasions, the men are deployed inside the turbine hall to continue with the turbine demolition. This process has to be repeated approximately 80 times until the chimney is reduced down to 35 metres. At this point, the platform and steel columns will be dismantled and the remaining part of the stack will be demolished using a high reach demolition excavator from ground level. While the chimney work was being done, other workers completely removed the two-boiler furnace and auxiliaries. All that remains now is the structure that supported the furnace suspended in place. This structure will not be completely removed, but will be lowered to a certain height, so as to be used as a storage hall. 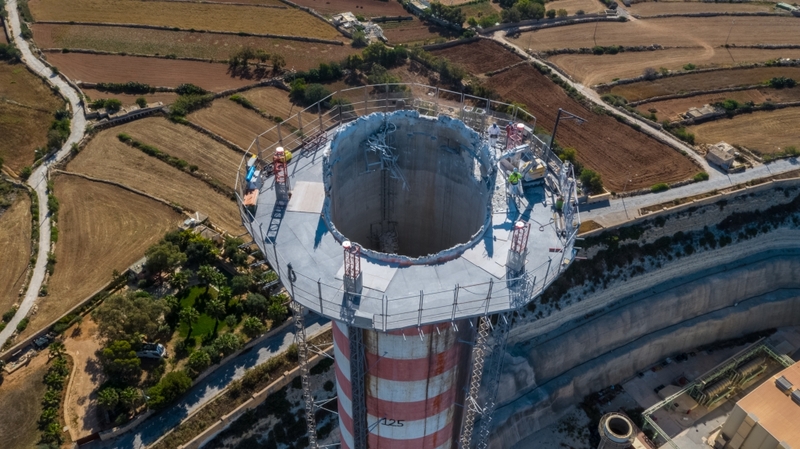 The year-long project includes the complete demolition of this concrete windshield and the two steel chimney flues, weighing almost 9,000 tonnes or the equivalent of 6,000 cars, as well as the plant’s boilers, turbines, generators and other auxiliary installations. Once dismantled, the plant’s materials will be carefully separated on site before they are carted away to authorised disposal sites. Over 5,400 cubic metres of concrete and other construction waste are expected to be removed from the site. Another 5,300 tonnes of metal will be exported for recycling. 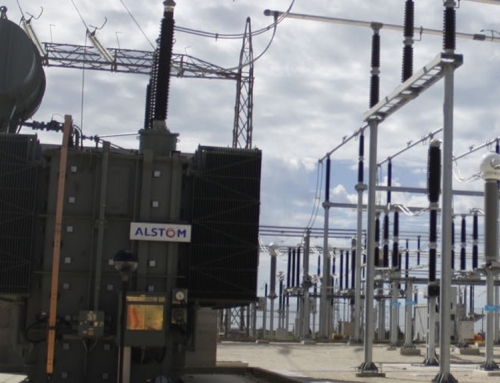 The 1992 120 MW Delimara 1 power station was switched off and put on cold standby in April 2017, before it was fully decommissioned on 1st September. 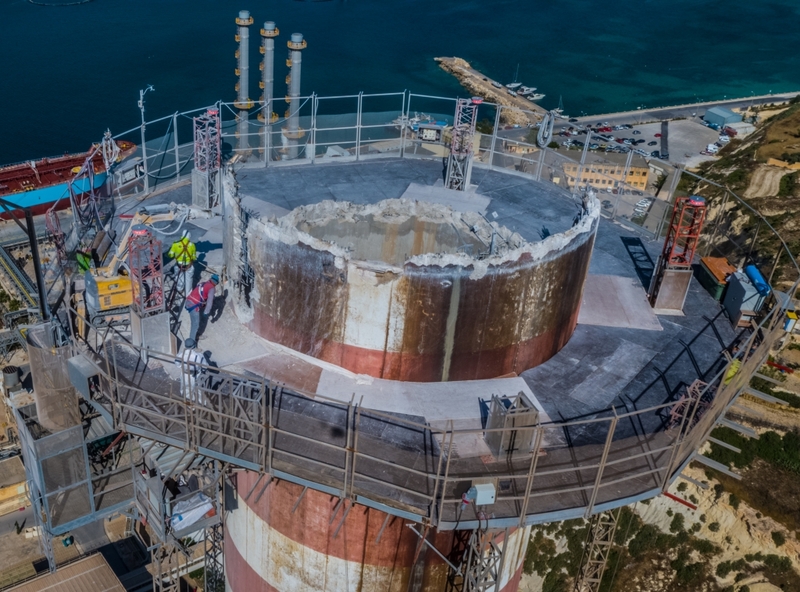 A few days later, the Italian demolition contractors selected for this project started delivering the heavy machinery and other equipment required to dismantle the plant. 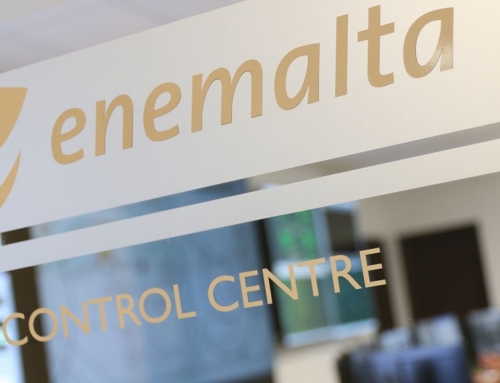 Ing Jason Vella, Chief Executive Officer, of Enemalta plc, explains how this project forms part of a renovation programme within the generation to provide a cleaner energy to our consumers to reduce the environmental impact. Ing Vella, would like to thank Enemalta employees for their cooperatioin and support in the ongoing works at Delimara Power Station.